The bascinet (bassinet, basinet, bazineto) was a Medieval European open-faced military helmet. It evolved from a type of iron or steel skullcap, but had a more pointed apex to the skull, and it extended downwards at the rear and sides to afford protection for the neck. A mail curtain ("camail" or aventail) was usually attached to the lower edge of the helmet to protect the throat, neck and shoulders. A visor (face guard) was often employed from ca. 1330 to protect the exposed face. 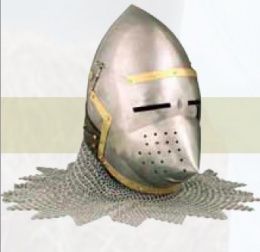 This style of helmet was used in 14th century Europe; an enhancement of the simpler scullcap which offered less protection for the face and neck. The visor with small slits can be pulled up; by removing the two metal sticks the visor may be taken off entirely and then resembles an archer helmet. The chainmail tippet does not only protect the neck but covers shoulders and throat too. Just like the visor it is removeable; it comes with a dark brown leather strip and is fixed to the helmet by threading a leather strap through the brass loops. The bassinet is handmade from 18 gauge steel, trimmed in brass. The helmet fits head sizes up to 68 cm (26.7") circumference; a padded cotton cap is included. This page was last modified on 13 May 2014, at 13:59.